1 in 2 Americans suffer from musculoskeletal pain, and unfortunately, drugs and surgery often do more harm than good. Case in point: highly addictive opioids, which aren’t a long-term solution for chronic pain and yet remain over-prescribed for many patients with musculoskeletal disorders. 1. What exactly does musculoskeletal pain/disorders entail? Musculoskeletal disorders impact the body’s movement or musculoskeletal system (i.e. the muscles, tendons, ligaments, nerves, discs, etc.) Examples of common musculoskeletal disorders include tendonitis, chronic back pain, carpal tunnel syndrome, hip pain and joint pain. 2. There’s been a lot of momentum in the digital healthcare space as of late, what factors are driving this trend? Our existing healthcare system is ripe for disruption, and it has been for a long time. The majority of the U.S. population is bouncing between Medicaid, individual exchanges and being uninsured, and for the relative minority who do have employer-sponsored coverage, getting the care they need isn’t always easy. Physicians are notoriously overworked and overbooked, making it understandably difficult for them to spend more than a few harried minutes with each patient. When it comes to chronic pain, though, a brief in-person visit every several months isn’t nearly enough. Digital healthcare models can enable providers to deliver more personal, proactive and accessible care options. 3. What are the most promising characteristics of non-traditional, digital healthcare models? Since it doesn’t rely solely on in-person, on-site care, digital healthcare is infinitely scalable, making it far more efficient, accessible and affordable for all parties involved. The current $3 trillion U.S. healthcare industry is built to support a traditional model of patients getting care from healthcare providers, but the majority of the time, patients don’t have a healthcare provider. Digital healthcare is delivering new tools so everyday people can engage in managing their chronic conditions. By leveraging technological advancements like AI and machine learning to derive real-time insights from patient health data, digital healthcare models can also deliver more proactive, personalized care. For instance, rather than waiting for a patient to experience pain (and make an appointment with their physician, wait a couple of weeks to be seen, drive to the appointment and wait in a waiting room), a digital approach to healthcare could allow a physician to continually monitor their patients’ incoming data and reach out to them before they experience any pain or setbacks. 4. How can digital healthcare be used by employers to better engage with their workforce? One of the great things about technology is that you can use it to target traditionally hard-to-reach segments of the population. We can empower truck drivers who are on the road 200 days out of the year and employees who are 100 miles away from a specialist to receive evidence-based, non-invasive care for their back and knee pain. Patients can remotely access best-practice care which saves an employee time and helps them stay engaged with the program. We can also help employers reach those who may be suffering in silence by tailoring campaigns to a specific population using mailers, email, on-site marketing and engagement of frontline stakeholders. 5. How is technology changing the way individuals with musculoskeletal pain are treated? Clinical evidence shows that guided exercise therapy and lifestyle changes are often more effective for musculoskeletal pain than drugs or surgery. Technology allows providers to deliver evidence-based care, rather than continually resorting to drugs and/or surgeries. For instance, with our program, patients receive a motion-sensing, wearable device that offers them real-time feedback on their personalized exercise therapy program. They also receive a free tablet where they can follow an education curriculum program and interact with their coach. Technology also saves time. Instead of taking hours out of their workday to visit a physical therapist or devote hours to combing through conflicting advice online, individuals suffering from musculoskeletal pain can do motion-sensor guided exercises, learn more about their condition and chat with a personal coach, all from the comfort of their own home and on their own schedule. 6. When it comes to managing chronic pain, pharmaceuticals — and more specifically opioids — instantly come to mind. What are some other effective yet safe options for individuals living with musculoskeletal pain? According to best practice care guidelines from the American College of Physicians and the American Pain Society, as well as research from dozens of clinical trials, a more effective, safe and long-term approach to managing chronic pain includes exercise therapy, behavioral health and coaching, and education. With musculoskeletal disorders, movement is key, so we offer guided, exercise therapy of stretching and strengthening exercises. We provide personal health coaches to keep patients motivated and help them stay accountable to their personal goals. We also deliver interactive patient education to help participants better understand their chronic pain, dispel myths about chronic pain, provide alternative options to surgery, and improve habits when life gets difficult or too busy. As a result, our patients reduce their pain by over 50% after just 12 weeks and have two-thirds fewer surgeries. 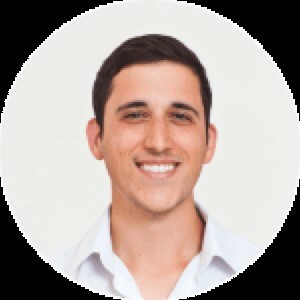 Daniel Perez is the CEO and co-founder of Hinge Health.With a long personal history of musculoskeletal injuries including several leg surgeries, Dan has long been passionate about improving outcomes for musculoskeletal disorders. Originally from Miami, Dan pursued a PhD in the medical sciences at the University of Oxford, founding the Oxbridge Biotech Roundtable and OneStart, the world’s largest healthcare accelerator program. As CEO, Dan brings startup technology experience and healthcare expertise to Hinge Health.